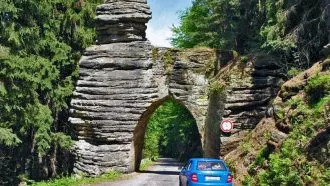 This walking tour is an excellent opportunity to spend your holiday discovering unspoiled nature and rich history, hidden in the very heart of Europe. 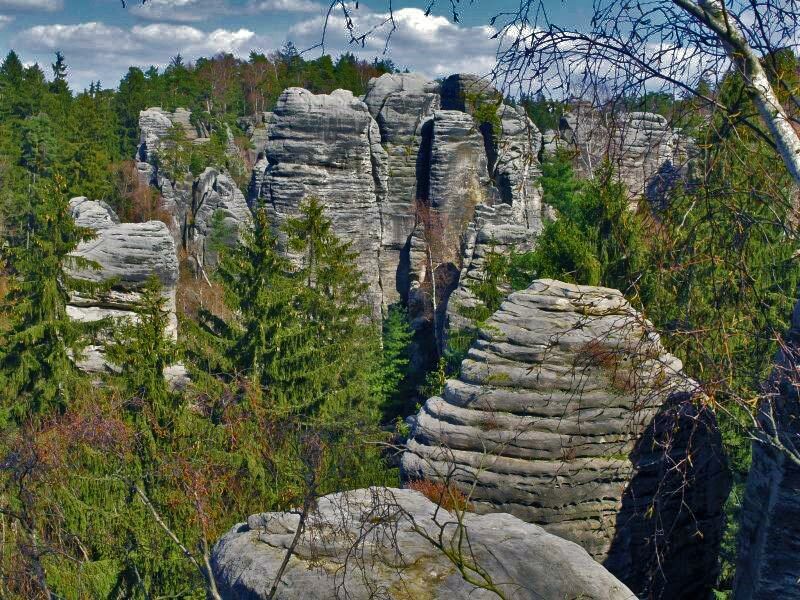 The Bohemian Paradise is a picturesque region situated 90 km north of Prague (Czech Republic’s capital). 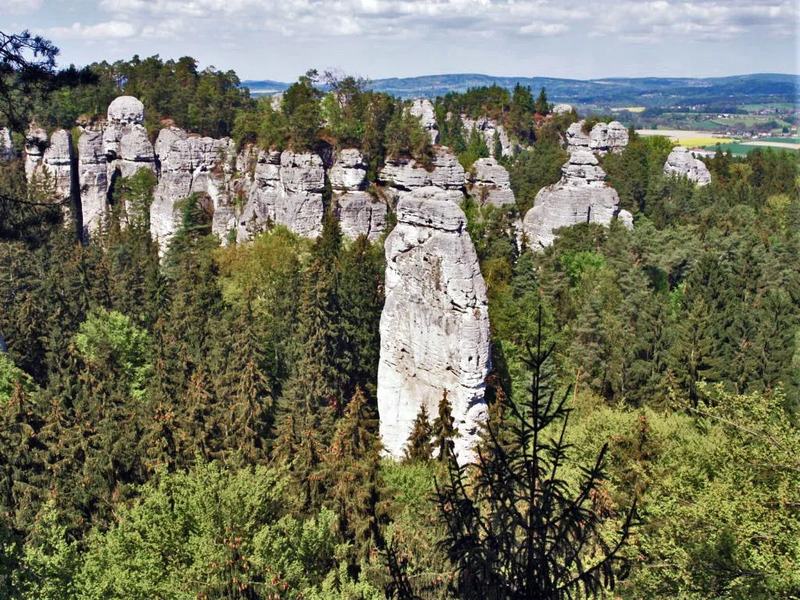 The Bohemian Paradise combines unique nature, sandstone rock cities, spectacular landscapes, remarkable historical sights, and rural architecture. 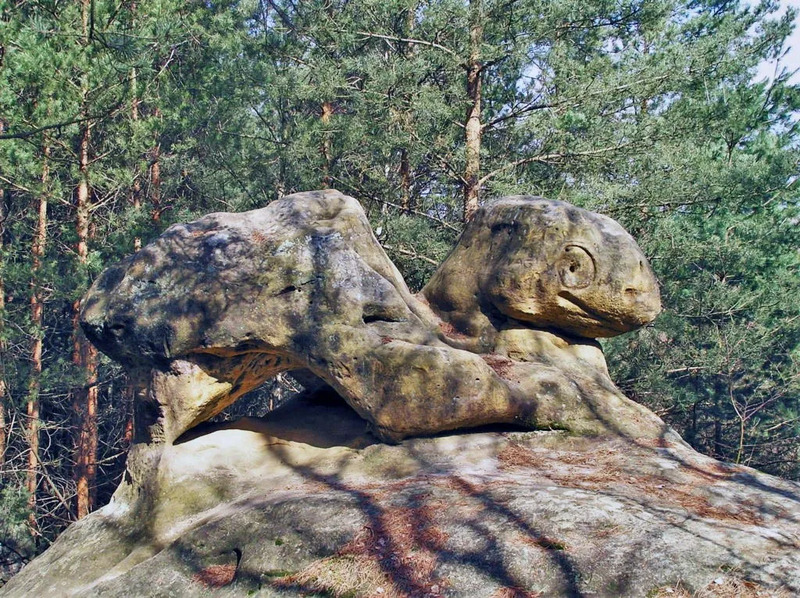 The area is included in the UNESCO’s list of Geo-parks. 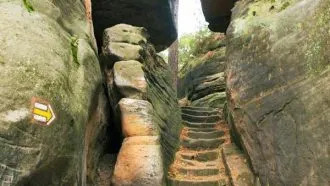 Your walk will take you through the narrow corridors of “rock cities”, exciting rock labyrinths, and splendid view-points. 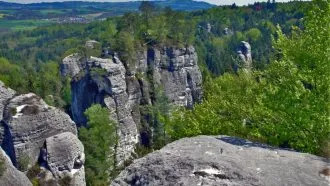 You will have the opportunity to explore castles, ancient ruins, waterfalls, and stunning rock phenomena. 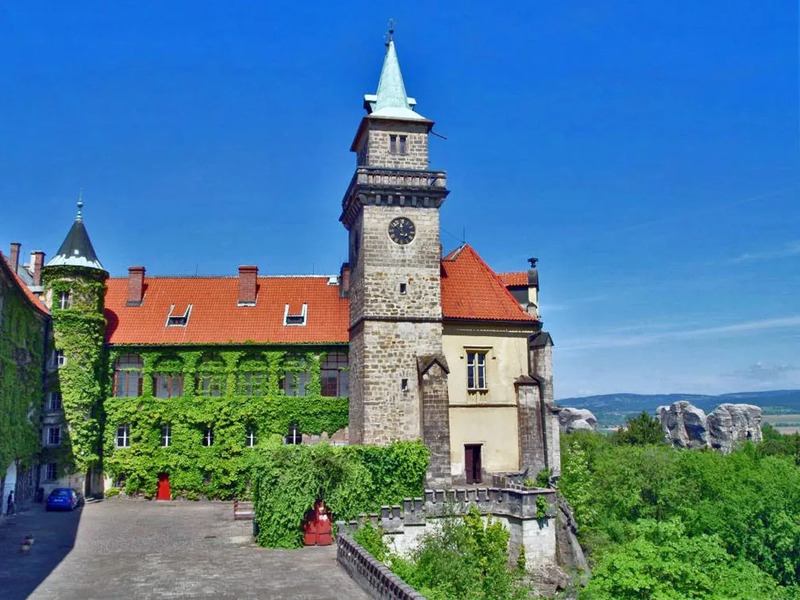 The route will take you for a visit of Trosky castle – the symbol of the Bohemian Paradise and one of the most incredible places to visit in the Czech Republic. Your holiday will start and end in Prague. 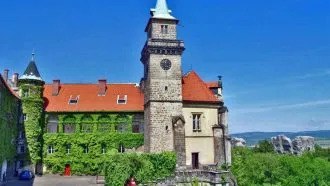 Upon arrival at the international Václav Havel airport in Prague you will have two choices: use the city public transport to get to the central bus station and take a coach from there to Jicin. Alternatively, you can pre-book a private transfer. 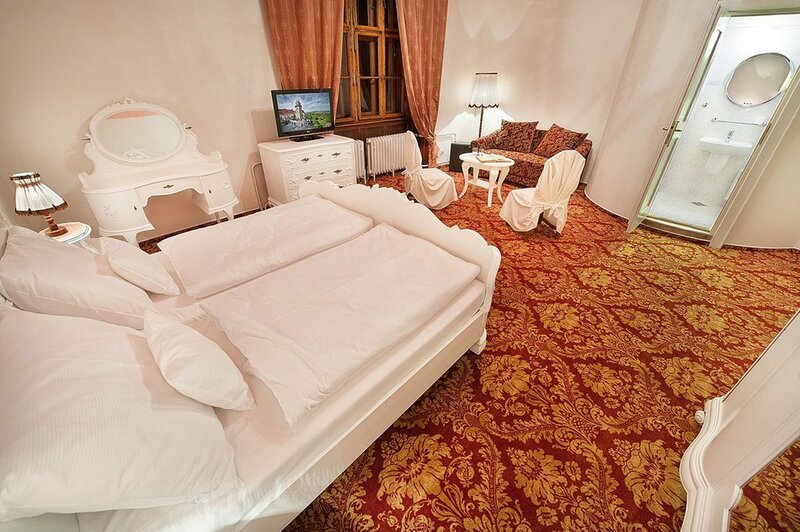 You can also book an extra night in Prague before the start of the holiday. 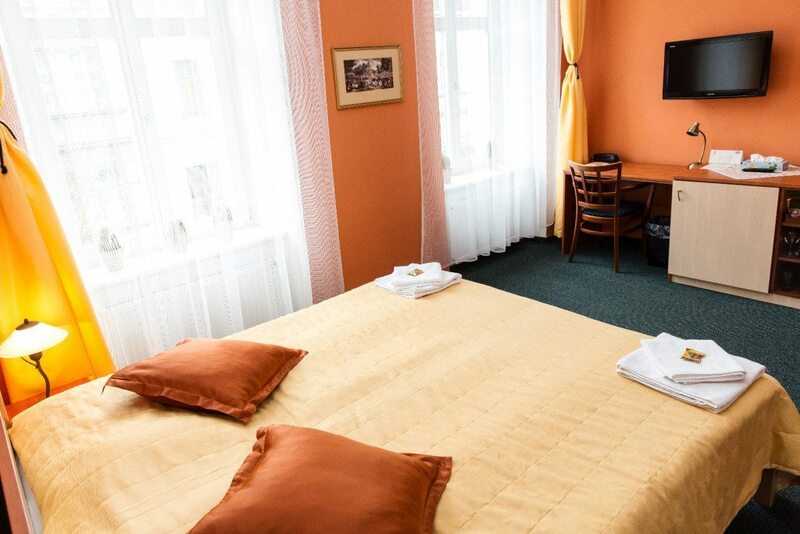 When you arrive in Jicin, you will check in at your hotel which is situated near the town centre. 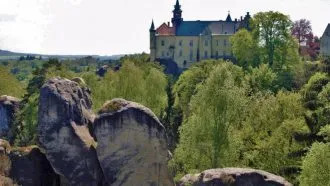 If you arrive during the day you will have time to explore the picturesque renaissance town of Jičín, one of the prettiest towns in the Czech Republic and the gateway to Bohemian Paradise. Sightseeing opportunities include a chance to visit the Baroque chateau and museum, and one of the most beautiful buildings in Jicin, the Hall of Three Emperors. 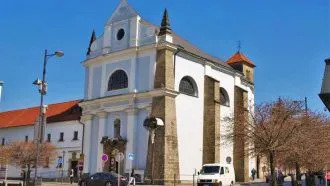 There’s also a chance explore the historical centre and Wallenstein square, as well as take a walk to the Valdická Gate (a three-storey tower from the late Gothic period) which provides the backdrop for the classic silhouette of the town and excellent views of Jicin. Additional places of interest include the Church of St. James the Elder standing next to the Baroque chateau and Valdicka gate. Accommodation: a 3+ star hotel in Jičín. On your second day you can choose between a longer (11 km) and a shorter (7.5 km) route. 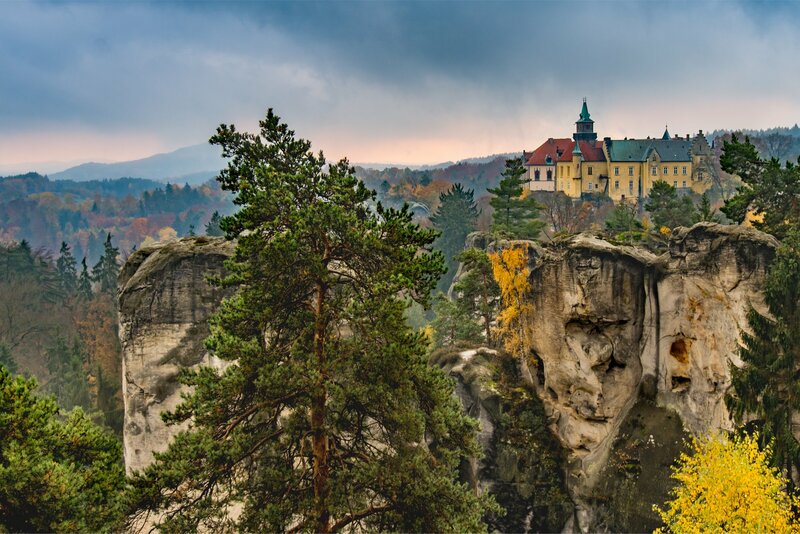 Both trails take you via an undulating terrain, through the rock city of Prachovské Skály, and end in Prachov. 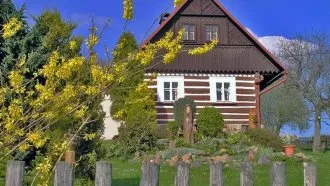 The longer route starts with a walk from the hotel to Valdštejnská Lodžie, a summer house, which is one of the most interesting landmarks of the Jičín region. It continues with a warm-up on the steep Zebín hill (a conical basalt peak), with a chapel of St. Mary Magdalene on its top. 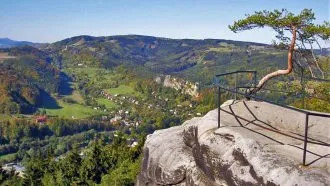 The peak offers a spectacular panoramic view over the entire Jičín region. 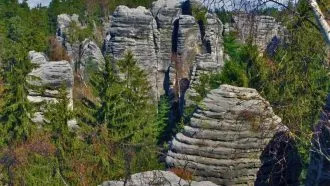 The trail continues towards the Prachov village and connects with the shorter route before entering the Prachovské Skály rocks. 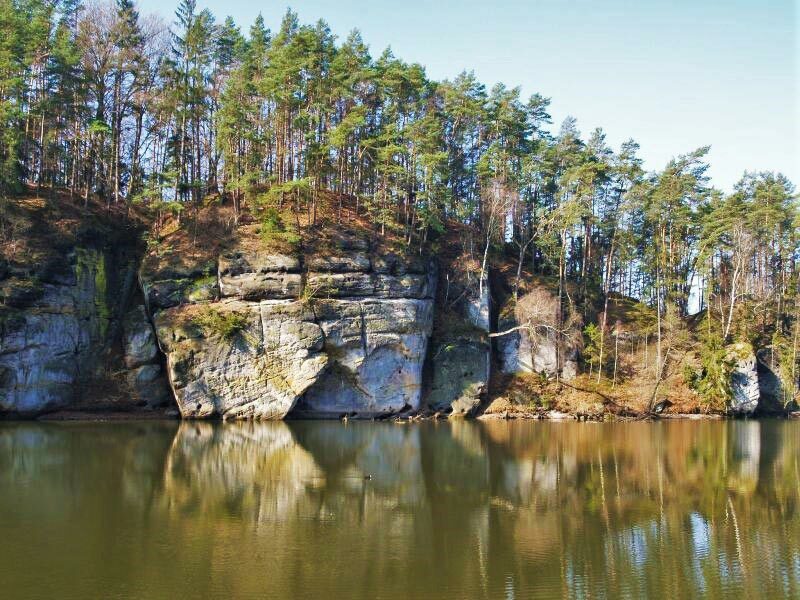 The beginning of the sandstone formations dates back to the Mesozoic era when the whole territory was flooded. Millions of years later, the region was pushed up by the effects of tectonic powers, the flood shrank back and the seabed split into separate blocks. 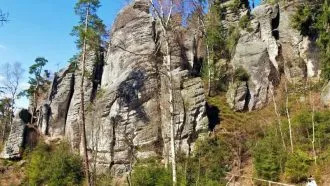 The walk takes approximately 3.5 h.
Walking for the day: Standard route: 11 km + circular walk around the Prachovské skály rocks 3.5 km. 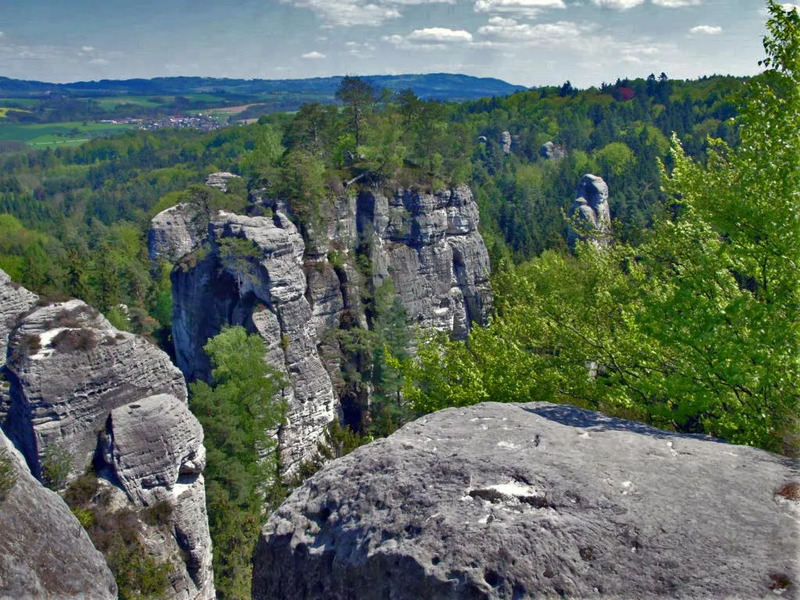 Shortened route: 7,5 km + circular walk around the Prachovské skály rocks 3.5 km. 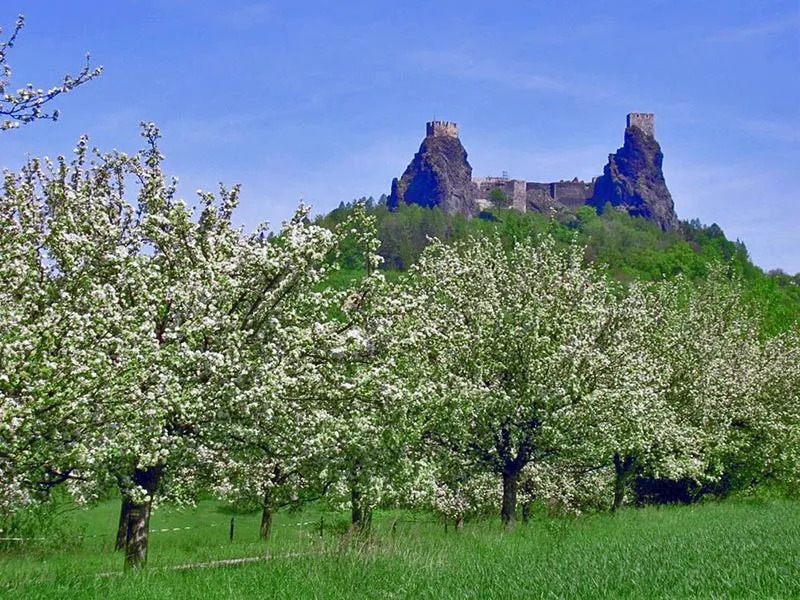 The third day starts with a walk through a mild terrain with beautiful views to the ruins of the Gothic rock castle Pařez. The castle dates back to the late 14th – early 15th century. Your route then takes you to the small town of Sobotka. 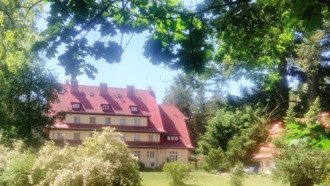 Humprecht – Baroque hunters‘ chateau from the 17th century. 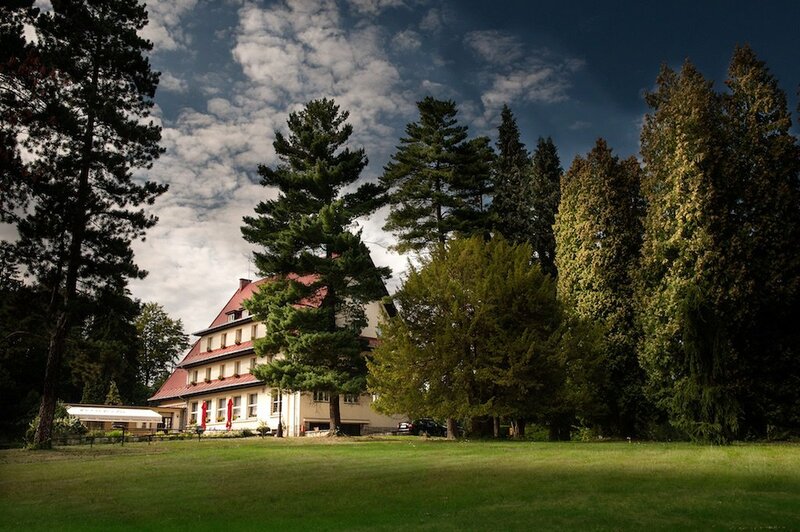 Accommodation: 3-star hotel, Sobotka, is situated at the end of the small town. 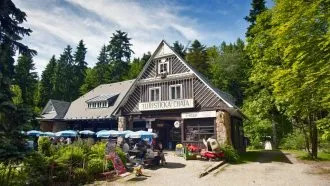 After breakfast you will head off to the small village Vesec – a favorite location to many film producers. 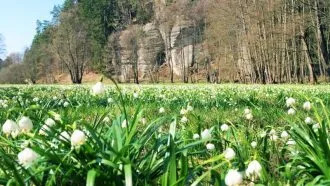 The walk continues through the valley of Klenice, by the Plakánek stream, passes by the Obora lake and reaches Kost Castle. 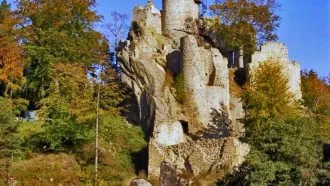 Kost castle is the best preserved Gothic castle in Bohemia. 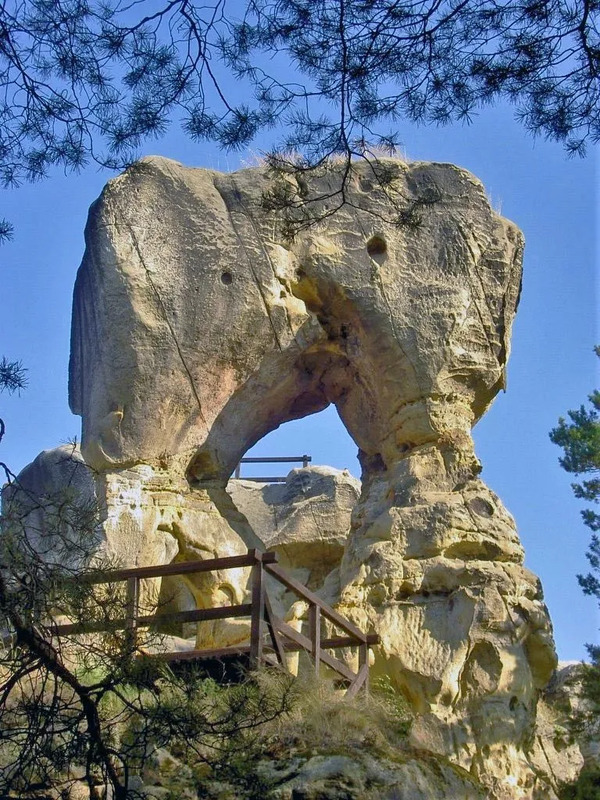 It was built in the end of the 14th century on a sandstone rock formation. You can take a guided tour in the castle. 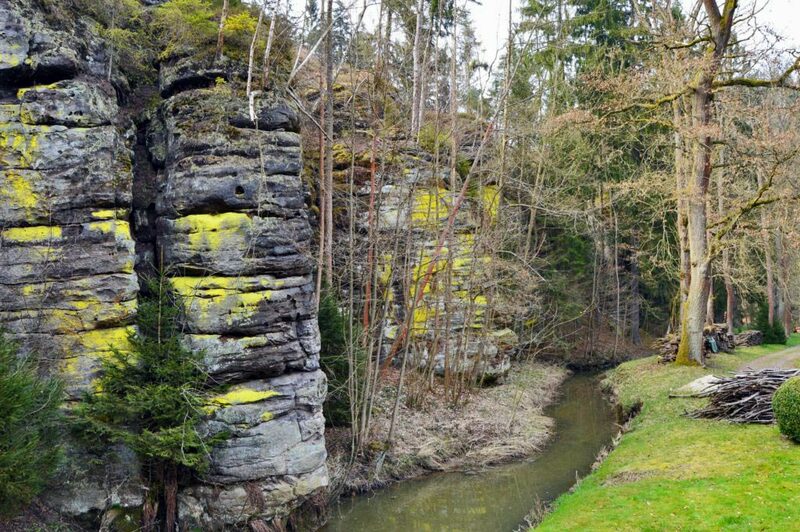 The next part of the journey continues through the Podtrosecké údolí valley, where in the 16th century locals built a system of ponds, preserved until present day. By one of the 8 marshes you will find a suitable for lunch restaurant. 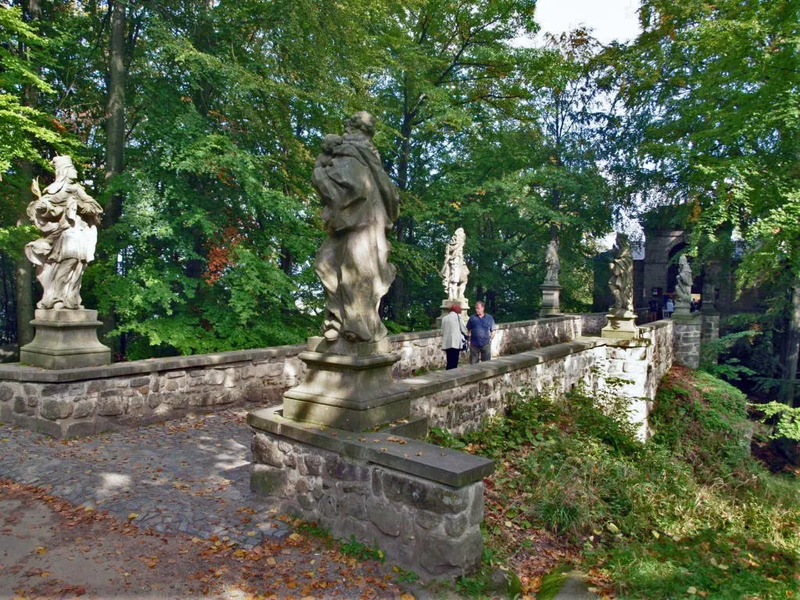 Last stop for the day is the Trosky castle – the symbol of the Bohemian Paradise. 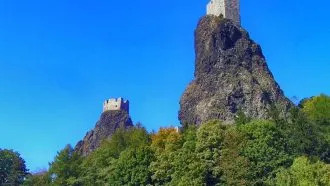 It was built in the 14th century between two volcanic rock massifs, with towers located on each hill. The higher tower is called The Maiden, and the lower and more robust is named The Old Woman. Thanks to its defensive stone wall and advantageous strategic position the castle stood well against all military attacks. Since the Thirty Years War the castle has become desolate. 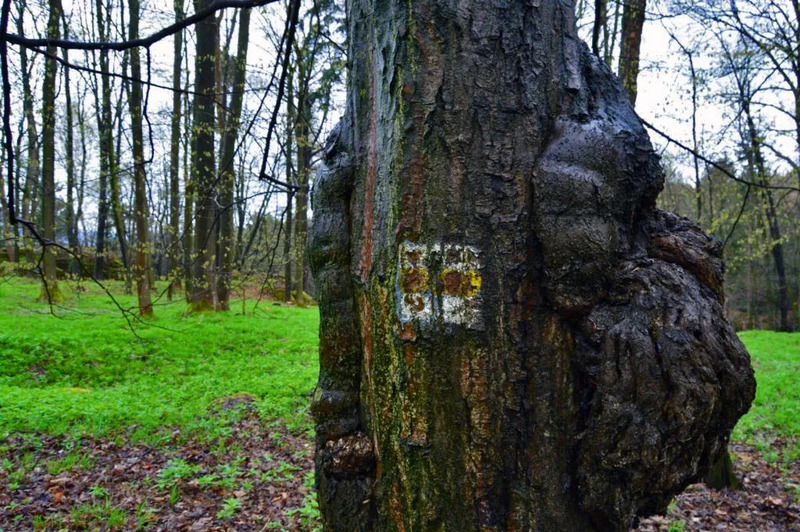 Walking for the day: Standard route: 26 km (6 – 7 hours). Shortened route: 18 km (4-5 hours). 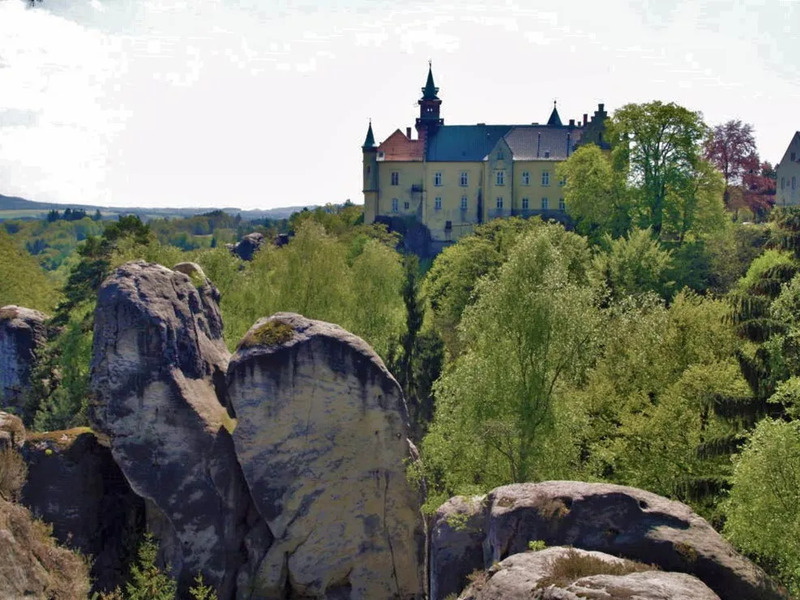 Originally a 14th-century castle later rebuilt into a Renaissance chateau, it is located on a sandstone bedrock in Český ráj (Czech Paradise) about 6 km south-east of Turnov just above the township of Hrubá Skála. 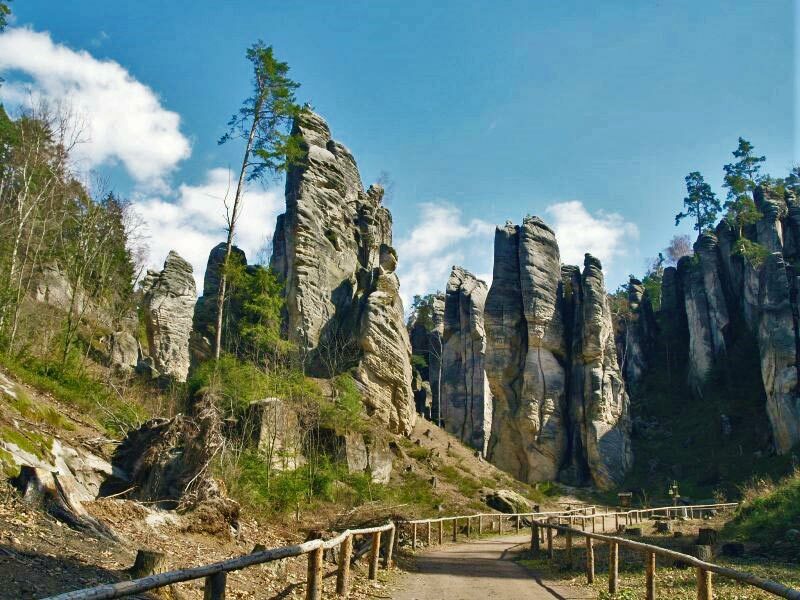 The day begins with a walk exploring Hrubá Skála rock city. 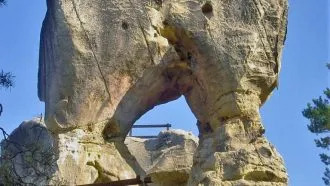 The rock city consists of about 400 sandstone towers. 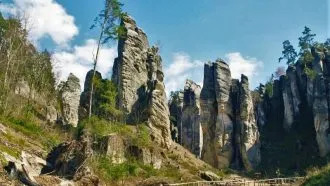 Some of them are 60 meters high (380 meters above the sea level). 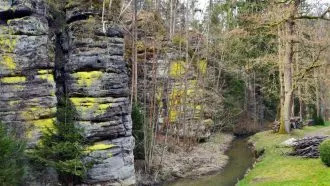 The trail leads you through the Bukovina arboretum, the Mouse Hole rock passage, and passes by the cave named Adam’s Bed. 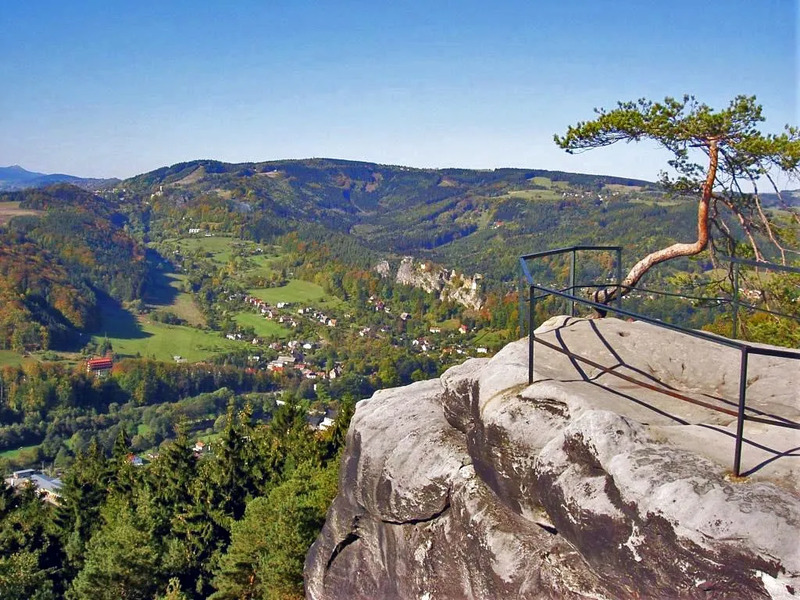 You will then reach a spectacular viewpoint called Mariánská vyhlídka which opens the most beautiful views of Bohemian Paradise. 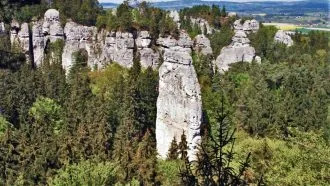 The path continues to the upper part of the Hruboskalská Plateau. 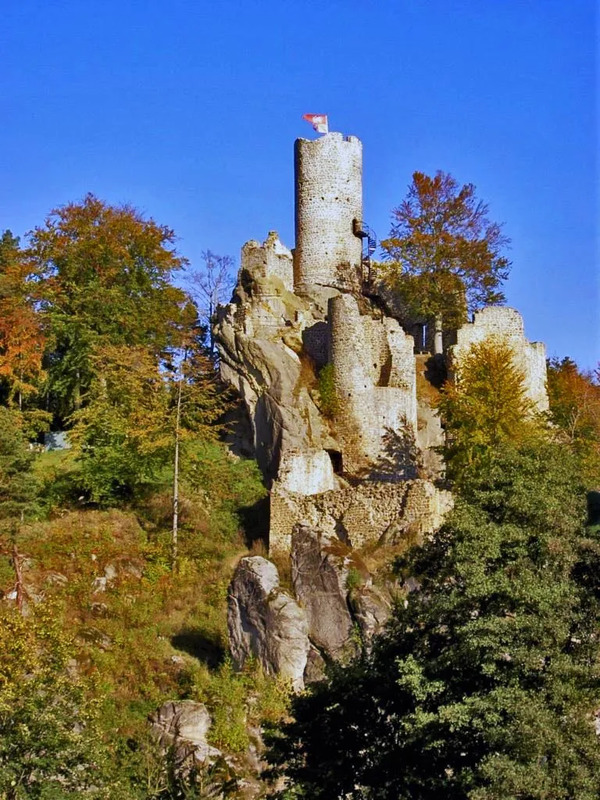 Situated on the plateau is your next stop – the Valdštejn castle, built in the middle of the 13th century. 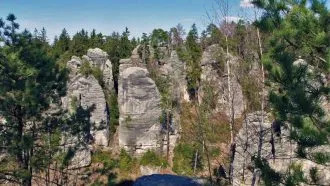 You will then continue to the end of the rock ridge Hlavatice (a lonely rock located at the edge of the Hruboskalská Plateau). 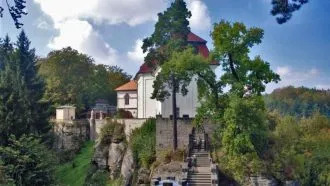 You will ascend to the top via stairs with railings to reach an observation point, opening a panoramic view on Turnov, Ještěd hill, and Bezděz. 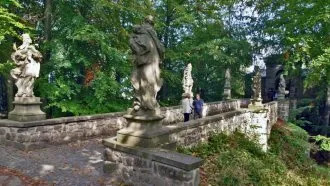 The trail continues with a descend to Turnov, where you will have the opportunity to visit the museum of the Bohemian Paradise. 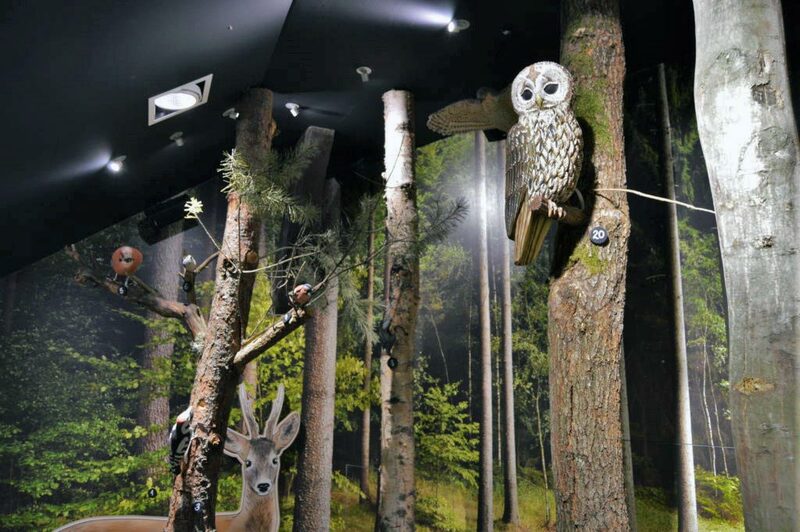 Next stop is in Dolánky – the modern museum of Bohemian Paradise nature. 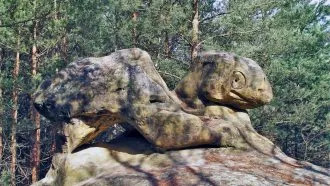 Then you will continue to Drábovna (a small rock town). 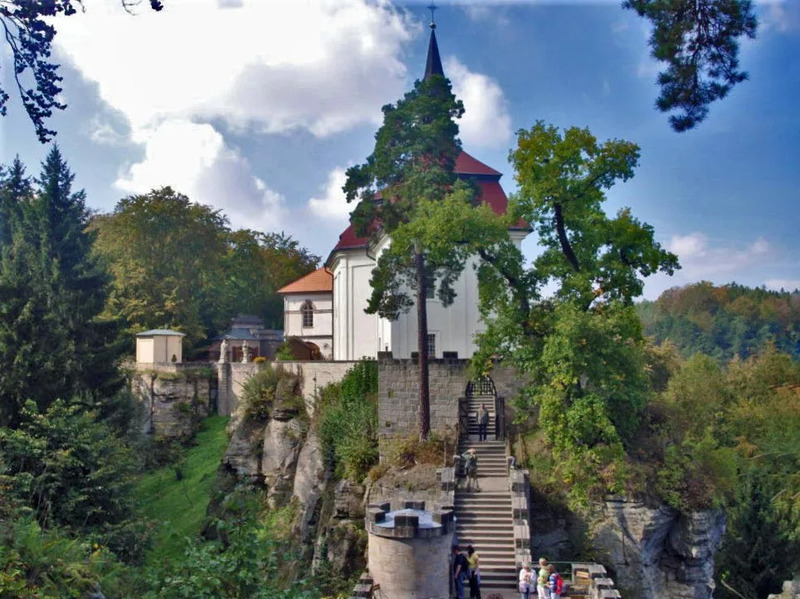 A marked path will take you to the ruins of a castle from the Middle ages – Frýdštejn, after which you will descent to the rock castle Vranov, also known as Pantheon. 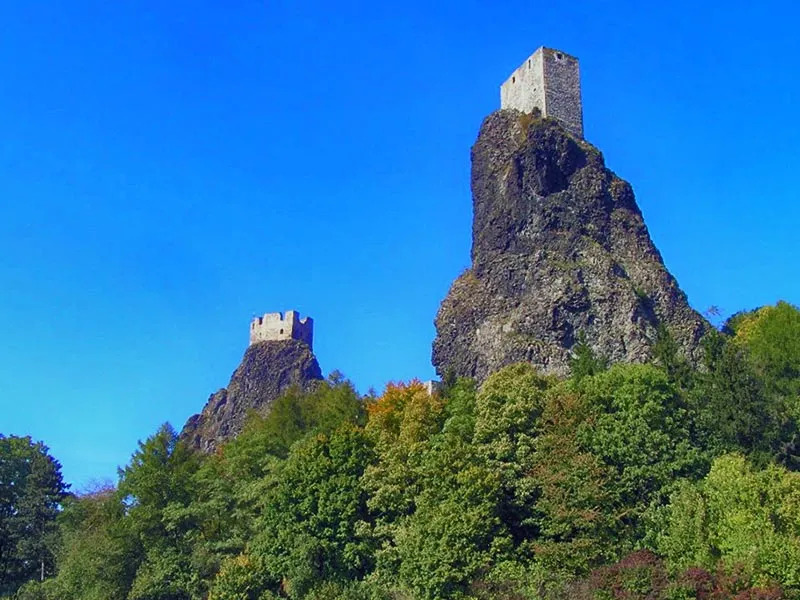 With its length of almost 400 m it is considered the most complicated rock castle in Bohemia. 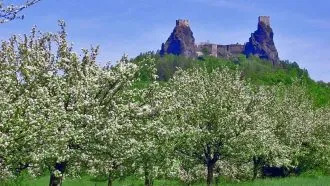 The form of the castle was determined by the sandstone cliffs, in which it was built before 1425. 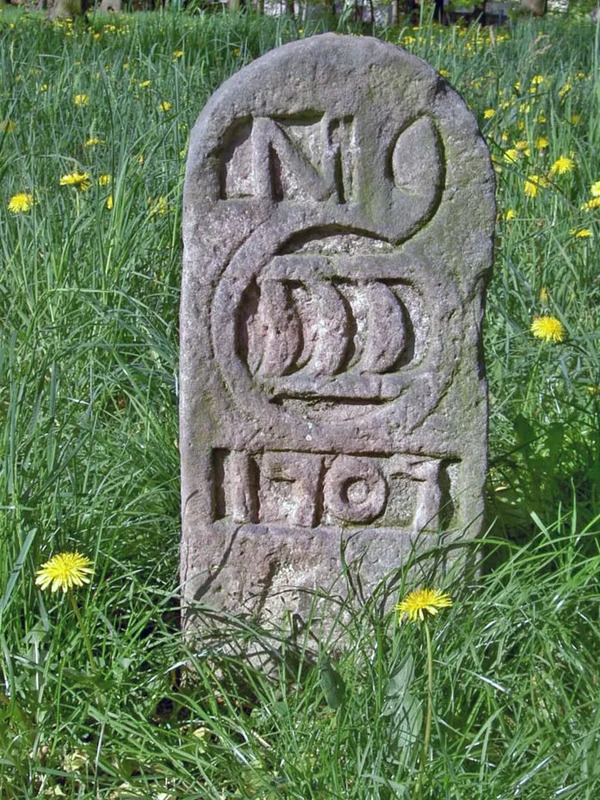 It was abandoned during the 16th century. Later modifications transformed the ruins of the castle into a romantic monument available to public called the Pantheon. Reconstruction was completed in summer 1826, when a chapel was built high above the Jizera valley. The trail ends with a descent to Mala Skala. Walking for the day: Basic route: 20 km (5- 6 hours). Shortened route: 15.5 km (4 – 5 hours). Accommodation: Kavka or Hotel Skala in Mala Skala, where you will stay for two nights. 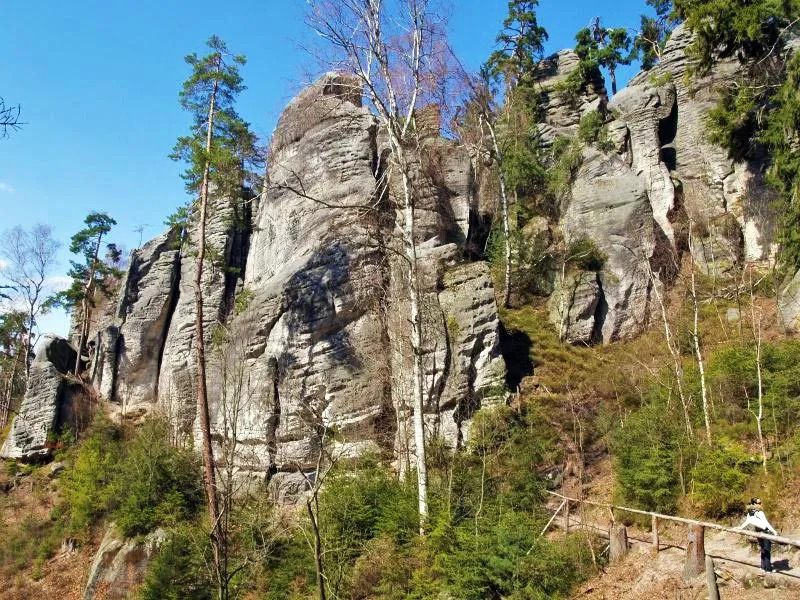 After breakfast your route begins with an ascend around Suché Skály (Dry Rocks) – a narrow rock massive from hard sandstone, lifted up by the Alpine-Carpathian folding. 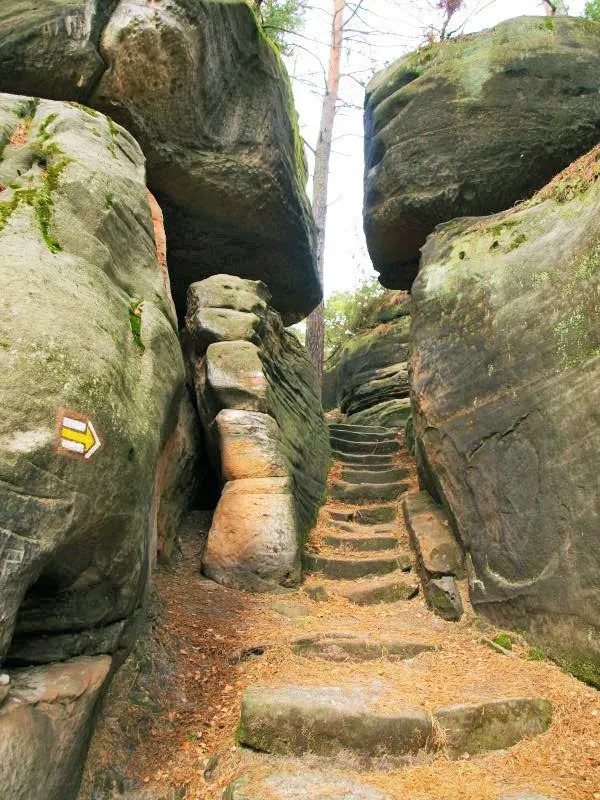 You will then continue to the Besedické Skály – a rock labyrinth. 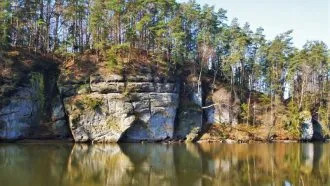 The Besedické skály Rocks are located on the left bank of the Jizera River above Malá Skála. The walls of the rock maze hide the Kalich praying room, among other things. 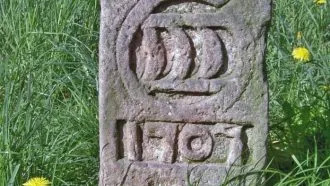 A ladder is cut into sandstone, with an inscription bearing the year 1634. 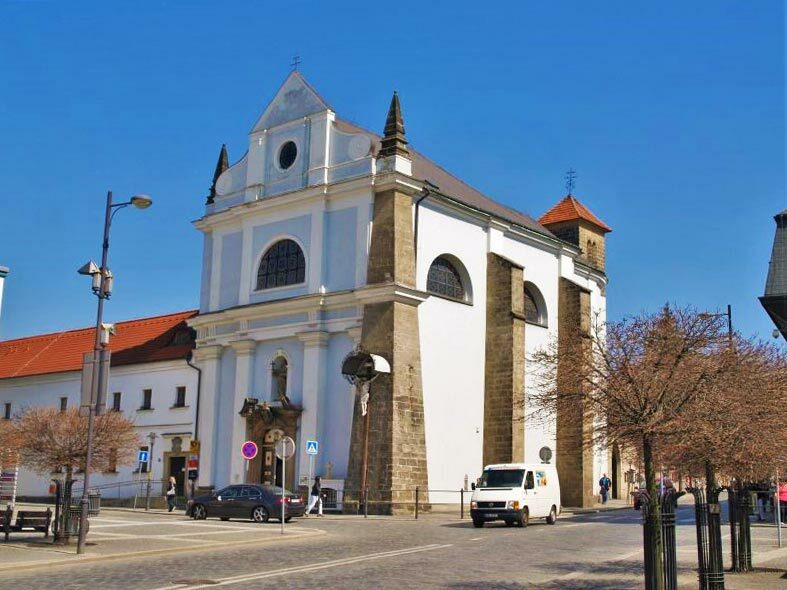 At that time, secret services of the Czech Brethren were held during the anti-reformation period. 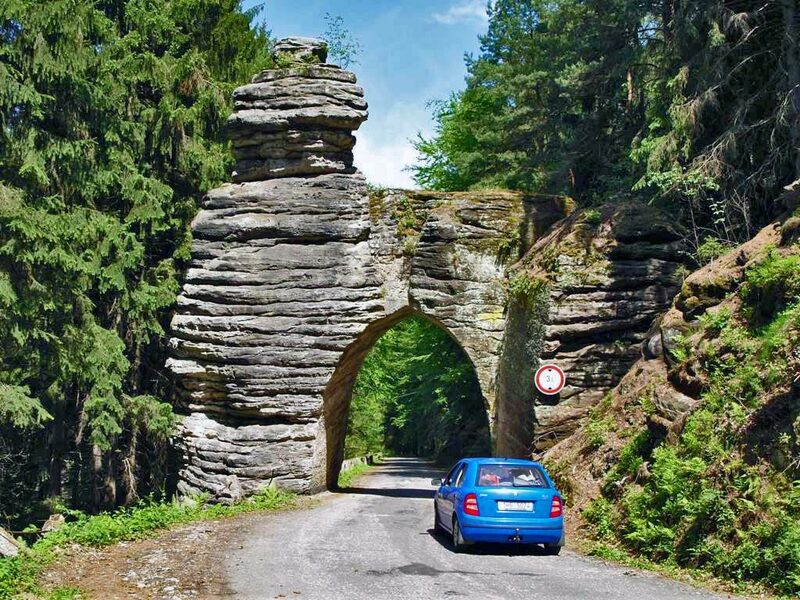 The route ends back in Mala Skala, where you can visit the Bouček’s farm. 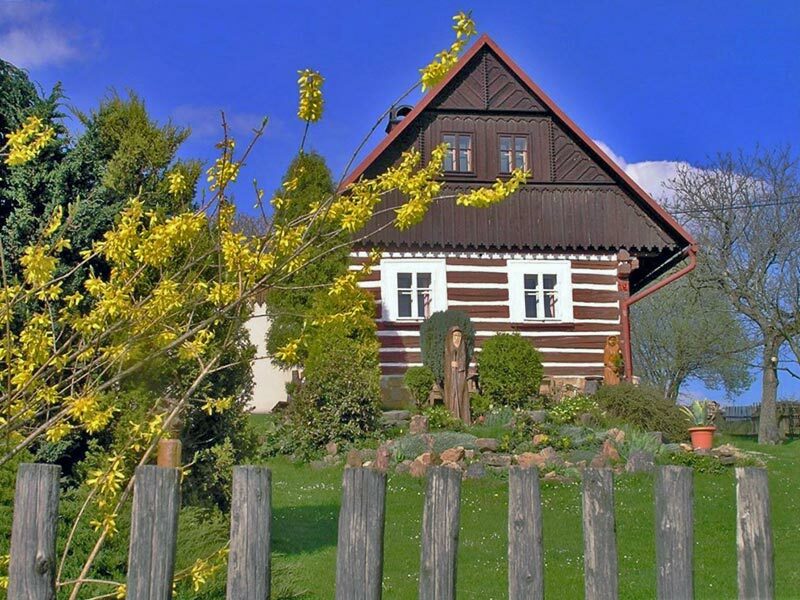 This is a two-storey wooden building with a gallery – a wonderful example of the rural architecture in Mala Skala region. 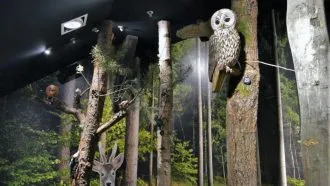 The gallery, named after Josef Jíra (famous local artist) exhibits a collection of paintings and sculptures made by more than 120 Czech artists of 20th century. A separate part contains permanent showcase of the painter Josef Jíra’s artworks. Departure to Prague during the day according to the bus schedule (not included). Private transfer is also available upon request and at additional charge. You will have the opportunity to get to know Prague in person: the City of a Hundred Spires, a UNESCO monument and one of the most beautiful cities in the world. Take advantage of one of the many free walking tours offered in Prague, or explore the city on your own – the choice is yours. Optional extra night in a 3 or 4-star hotel in Prague. 3-star hotels, as indicated in the itinerary. 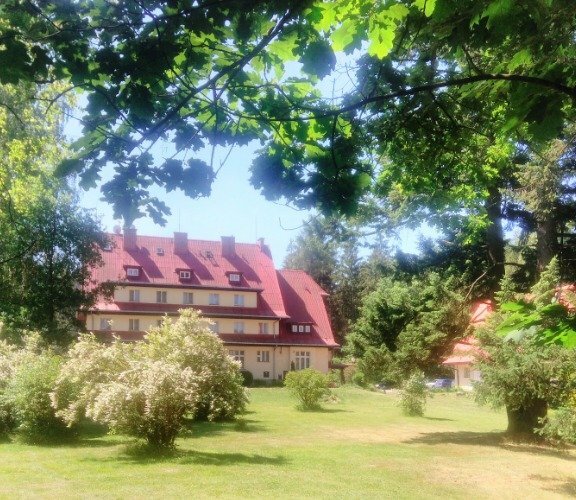 The hotel in Hrubá Skála offers spa facilities. All places have been carefully handpicked by us and their quality is regularly monitored. We have tried to choose accommodation that offers friendly service, clean and comfortable rooms and local flavour. All hotels offer wireless Internet connection. Breakfast is included. When no restaurant location is available en route lunches and snacks should either be bought from local shops, or packed lunch can be pre-ordered from your hotel the night before. Dinner is available either from the restaurant in your hotel or from restaurants and taverns in the village nearby. Terminal 1 is used for flights outside the Schengen Area. Terminal 2 is used for flights within the Schengen area. City bus No. 100 takes you from the airport to the final bus station named ZLIČÍN. You should then take the underground (Metro) line B and go to the final underground station called ČERNÝ MOST. Do not confuse it with the bus station Černý Most. When you exit the metro, you’ll find the Central Bus Station, where you can catch a coach to JIČÍN (your first town). 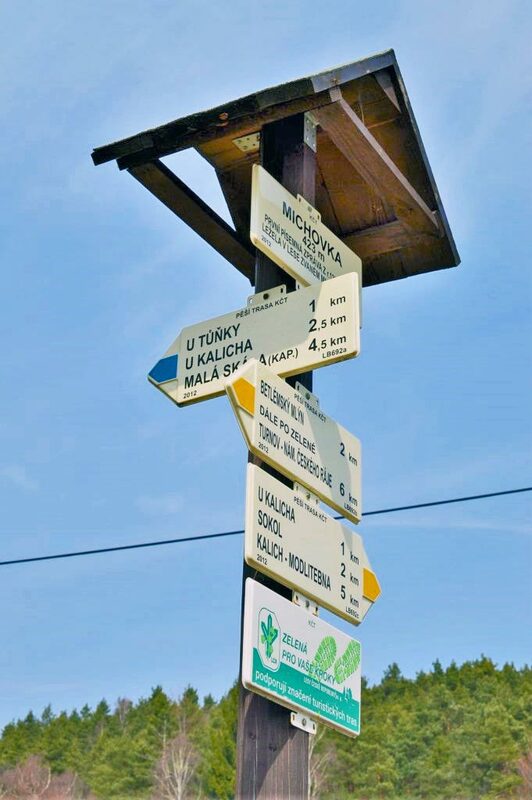 Buses to Jicin leave from bus stops No. 1, 2, and 4. Fare is about 140 CZK (GBP 4.50). Detailed timetable and additional information you will find in the Info Pack, provided to you upon booking with us. The bus stop is on the main motorway in Malá Skála, about 200 m across Jizera river. Buses go to the bus station Černý Most in Prague. Please note that only one airport transfer per party is included, though additional transfers can be arranged. It is advisable therefore that all party members arrive on the same flight or at least at a similar time. Night transfer extra charges may be applicable on private transfers in case of late night arrivals. Language: Czech. In big cities many people speak English but in remote areas this might not be the case. Young people speak English and the elderly understand Germans or Russian. Hotel personnel speaks English and are always available to assist. You can always call our 24/7 help line if there are any problems. Currency: Czech koruna, sometimes referred to as Czech crown (CZK), pegged to the Euro (1 Euro equals 27 CZK, 1 £ – 28 CZK) and therefore fluctuates directly with Euro/GBP rate. We strongly advise taking sufficient cash for your daily requirements. CZK Bank-notes are 50, 100, 200, 500, 1 000, 2 000 and 5 000 CZK. Coins are 1, 2, 5, 10, 20 and 50 CZK. Banks and ATM are available and credit/debit card payments are widely accepted in towns and cities and in big petrol station chains, but might be limited at some of the villages we visit. You can withdraw money from ATMs Jičín, Sobotka, and Turnov. 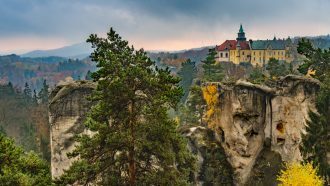 Up-to-date travel advice on Czechia is available here. Appropriate for regular walkers. Requires reasonable level of fitness. The trip covers an average of 18 km (6-7 hours) of hiking per day, with a possibility of shorter walks (read more about our difficulty grades). You will walk mostly on forest or meadow roads, and through rocks labyrinths. 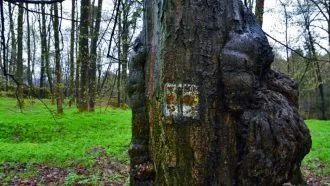 All trails are well-marked. This trip as available from April until October. Weather is best in June – September. As July and August are the busiest months, it is preferable that you book as early as possible. Prague can become overcrowded in summer months. The flexibility of self-guided holidays means that there are no fixed dates and you can start your holiday on any date in the season, therefore please indicate desired starting date when booking. The climate is typical for Central Europe. Humid summers with occasional hot spells, and cold, cloudy and humid winters. If you are planning a trip to the Czech Republic, weather will probably be one of your concerns. 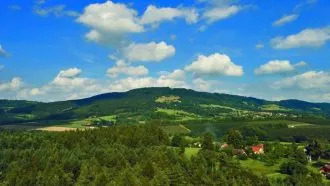 Czech Republic’s climate is comparable to that of southern inland Canada. 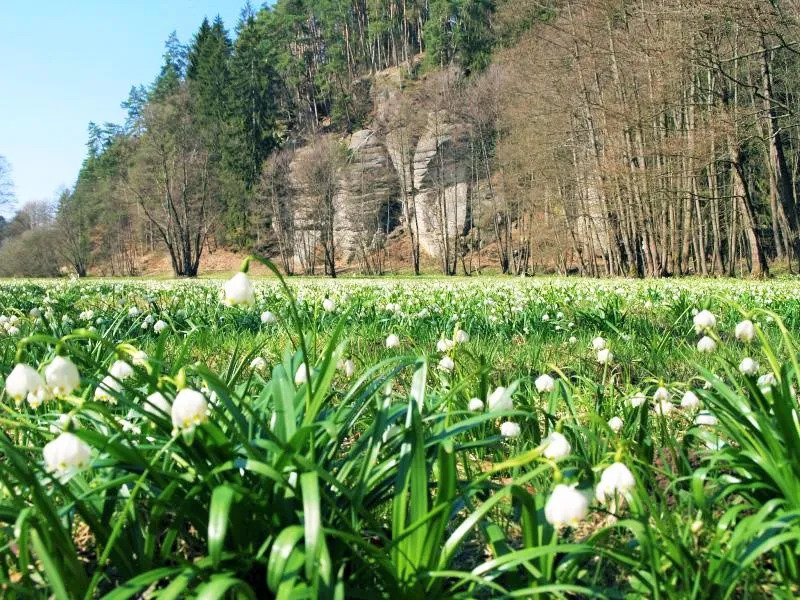 Summer in the Czech Republic typically covers the period from June through mid-September. 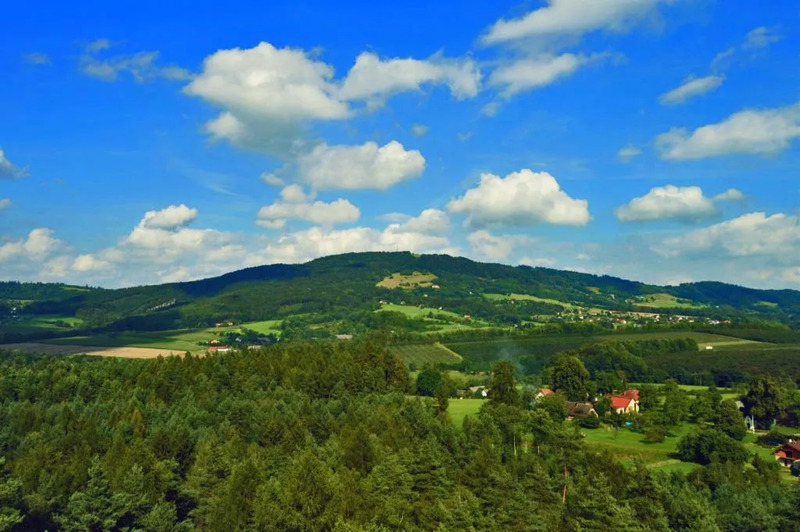 Czech summers are usually mild (20-27°C/70-80°F) and somewhat humid, with the highest temperatures up to 30-35°C/85-95°F (occasionally higher) for short periods. Such heat waves can be expected in July and August. Sudden showers and thunderstorms are common, so bring an umbrella or be prepared to dash for cover. We recommend that you travel as light as possible because airlines might charge you an extra fee, and during ground transfers place might be limited. Ideally, you should bring one piece of luggage weighing not more than 25 kg (to be checked in) and a daily pack (15 – 20 l rucksack) for your daily essentials (snacks, drinking water, camera, etc). Below is a non-exclusive list of what you should bring to this trip. More detailed info will be included in your holiday information pack. If you need further advice, please contact us or a reputable outdoor retailer. Castles & museum entrance fees: approximately £15 per person (total for all locations). We had a brilliant time, everything worked perfectly and even the weather was great. 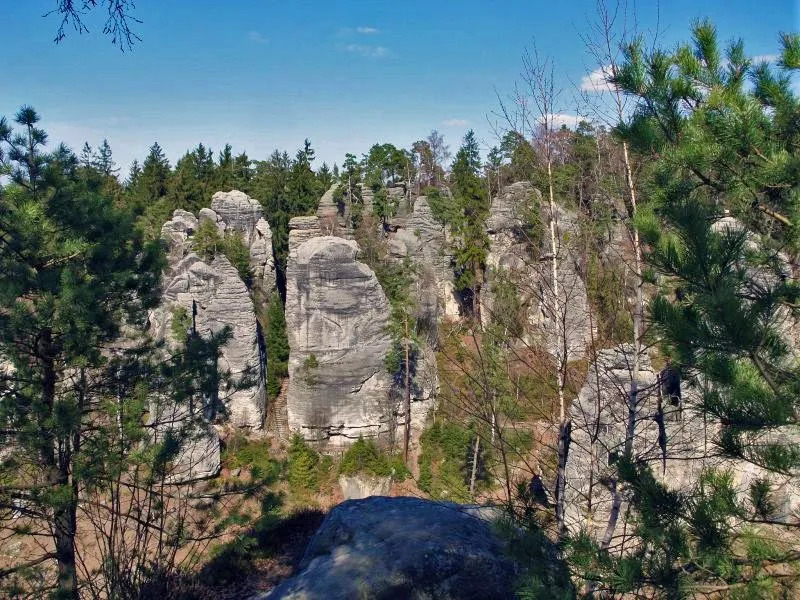 We saw the most spectacular beautiful natural environment, clearly popular locally but how is this not better known outside Czechia? The booking process was easy, and any queries we made by email were quickly answered. One hotel took a long time to find our booking but this was resolved. The trails were excellent and easy to follow although the colour coding in maps, signs and notes did not always match up. Good distances each day with some more strenuous uphills but nothing to frighten even a vertigo sufferer. All the luggage transfers were fine, as was the meeting at Prague Airport to get to the start, we did not have or need any direct contact with local reps. The accommodation was all very comfortable and friendly, with excellent food at both breakfast and evening meals, generally focussed on local cuisine which might have to be adapted if vegan diet was wanted (not an issue for us) but we loved it! This was our second trip with Natural Adventure Company, and both have been superb, so we will definitely use you again next time we are going to a country with your routes. We had a wonderful holiday and loved every moment. Every day and every stay was different and I really cannot pick one walk over another. I was very pleased to have booked the transfer as it took a level of stress out of arrival, and we ended up getting a transfer back to Prague as we travelled on a Sunday and I hadn’t realised there were no buses, however Petr sorted this out very efficiently. Everything went very well, no double in one of the hotels but no problem. 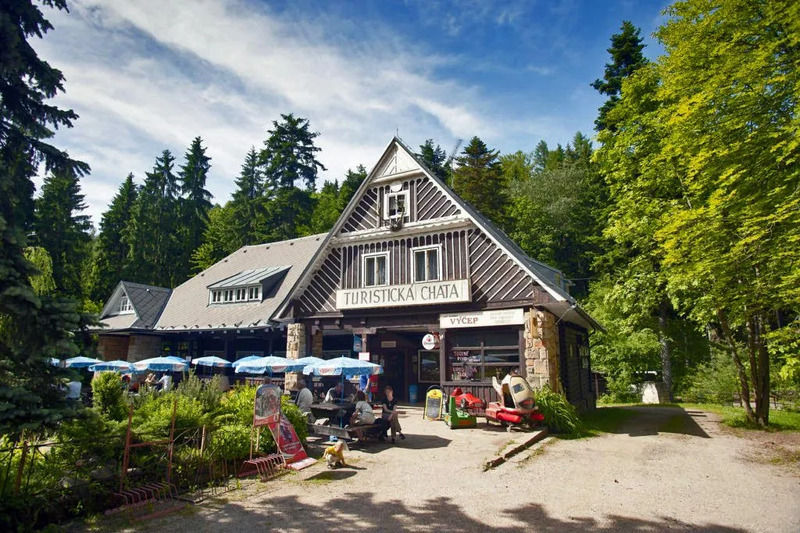 It would have been really nice to have some recommendations on where to eat or drink in each location and also to know that at the castle hotel Hrubra Skala there are no other options other than to eat in the restaurant and there is no bar. We actually ended up using the navigation app more than the maps, very useful especially at the beginning of each day when the instructions on which trail to use were sometimes confusing. We really enjoyed the variation in the hotels and the walks, and would definitely look at using the company again in the future. 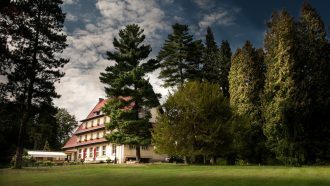 Bohemian Paradise was our second excellent trip with Natural Adventure Company and was all we hoped. Excellent beautiful walks, challenging but easy to follow, great accommodation and food, and perfect organisation of transfers, pick ups etc. We will be back for more! I just wanted to let you know how much we enjoyed our holiday in the Czech Republic last week. The walks covered extremely beautiful, varied terrain. We loved the rocks and castles. Everything went smoothly and the app was easy to use. The information about each walk was helpful and interesting; it was good to know what to expect and look out for. The hotels were of a high standard, particularly those for the first four nights. We will recommend it.